And I’ve got a black toenail to prove it! S-C-O-R-E! Ok – so that ruined your breakfast! Sorry about that! So during my training — I gave up on pedicures and learned to accept blisters, and to love calluses. Oh yea, calluses are a critical tool in getting through the Marathon. No body should run on soft baby feet. I was reading a running bulletin board leading up to the race, and a lady mentioned how she was going for a foot massage as a treat to herself before the race. I thought the board was going to melt my computer. Dozens of people jumping out of their swivel chairs, and posting the following to that sweet little newbie (it coulda been me! )….”DON’T LET THEM REMOVE YOUR CALLUSES”! Turns out calluses are a hard-earned, well suffered, protective covering that your feet are gonna need on Race Day. Another Badge of Honor. Hey, I get it. calluses, black toenails, blisters — they ain’t pretty. And they cost me. But I paid for them. I’ve earned them. Like little Girl Scout Badges. No Sewing Required. 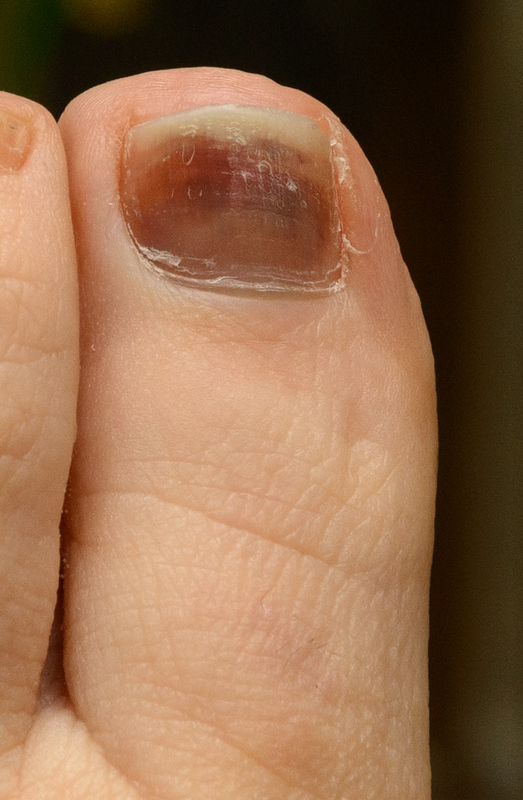 While my black toenail is like a treasure…kinda like my finisher’s medal…..it’s also an injury. The B.I.G. myth of the black toenail may be — that it happens because your toe is pushing against the toe box of a sneaker that’s too small. But it turns out that most black toenails are the cause of simple pressure and impact from below. Simply banging on those poor little toes on the pavement, step after step after step….well, over 46,000 times during the 26.2 mile trek. Not including the hundreds of thousands of steps taken during the 18 weeks of training. Take it from me. First they turn a little pink down at the bottom. Then a little deeper purple. And before you know it, you’re taking a bubble bath and….and Bang — the toe is definitely turning black. I’ll be keeping an eye on it — but I think I’m gonna lose that baby. C’est la vie! So, as you can see, my feet are a bit neglected. A bit abused. Very rough around the edges, and in need of some soft, scrubby, heavenly-massage attention ….oh, and some toenail polish. But until I can manage the time for that……. Ahhh. I’m going to enjoy this physical reminder of the G.R.A.N.D. Adventure that took place on Jan 13, 2013. This glorious badge of honor, this reminder of my gynormous personal victory ….ranks RIGHT up there with the first time I pee-d in the woods…er, -all over my own sneakers!!! Ahhh…proud moments, proud moments indeed!